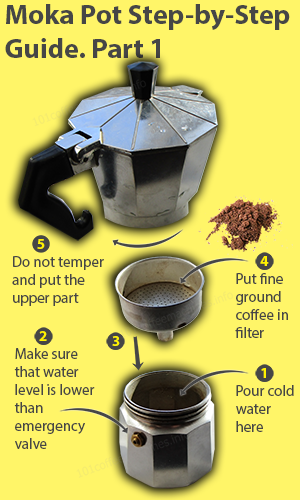 How to make coffee with moka pot? The guide. Do not wait till big bubbles appear. Try to put off before this moment. Optionally, you can put lower water tank under the cold water from faucet to stop the exctraction proccess at the right time. Very informative. I have noticed that some pepole recommend using hot water to furher avoid overheating. What do you think of it ? Yes, it probably makes sense. 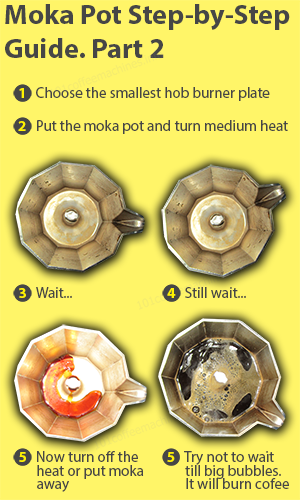 Because the middle part (filter with coffee) and the upper part will have less time to be heated by the stove. Nevertheless, I think that the anti-overheating effect is low and this is made primary for speeding-up the whole proccess.